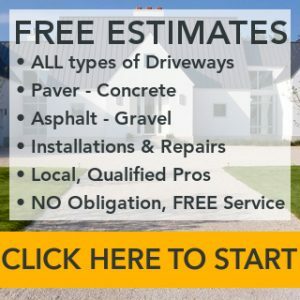 In this RenoCompare driveway cost guide we will outline exactly what you need to know to calculate the cost to install driveway pavers for yourself. 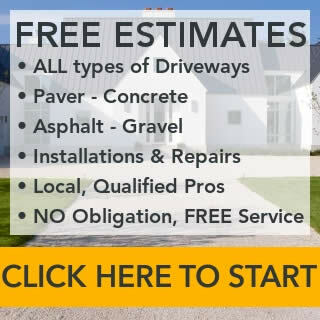 Armed with your own accurate paver driveway estimate you will be a in a perfect position to start requesting quotes from professional driveway contractors. You should know that the biggest variable for pricing a paver driveway is the cost of the pavers themselves. Concrete pavers are the cheapest, followed by brick pavers, with natural stone driveway pavers being the most expensive. Read our driveway pavers buying guide for further information. And if you’ve not yet decided on driveway pavers be sure to browse your other driveway options and ideas. We start with the bottom-line costs for paver driveways given the most common installation scenarios. Then, we break down those costs to show you where the money goes. Note: A gravel driveway base and the base layers beneath asphalt and concrete can typically be used for pavers instead of removing them and installing new base layers. When this is possible, it creates significant cost savings for material and labor. Discuss this possibility with contractors when receiving paver driveway estimates. This detailed list of costs addresses only those that are typically itemized. Compaction, for example, usually isn’t listed as a separate cost. Not all these steps will apply to your project. Removing an asphalt driveway takes less time and doesn’t require the same heavy equipment that concrete driveway removal requires. Pavers need a deep and stable base to prevent settling. On most projects, 12-16 inches of soil will be removed. Some homeowners have the excavated soils relocated on their property for use in landscape design. Others have it hauled away, which incurs higher costs. Not all paver driveways are built the same way. Soil conditions and the climate in your area might indicate that slightly different materials or depths would be preferred. Bottom base layer: Six inches of 1” to 2” diameter washed crushed stone. Middle base layer: Four inches of ½” to 1 ½” diameter washed crushed stone. Note: Washed stone is thoroughly rinsed with water to remove sand, dirt and dust, making it more stable. Crushed stone is used because the broken edges knit together to produce far greater stability than round stone. Edge Restraint: Restraints keep the paver stone field from spreading outward, creating gaps between pavers. Most is made from sturdy plastic and held in place by 10” galvanized spikes. Poured or pre-cast concrete and pressure-treated lumber are other material options. Pavers: Single layer of pavers 2 3/8” thick. They are available in many materials, lengths and widths to suit your style. The costs given above are for basic paver driveway projects, and most jobs fall into the basic category. However, there may be circumstances that create additional costs. Wooded property: Clearing wooded land will significantly add to the job cost. The heavier the woods, the more the price will go up. Keep in mind, though, that mature trees, especially hardwoods, have timber value and can possibly be sold to a company that buys standing timber. Excavation costs for wooded property rise by 25% (lightly wooded, small-diameter trees) to 500% (heavily wooded, large-diameter trees). Extra fill required: When excavating a new driveway, any low spots should be filled to create a level drive. Adding drain tile: Water softens and erodes the base layers of a driveway, and that creates multiple problems. Some water issues can be alleviated with drains and drain tile. On average, 12-15 feet of tile is installed per foot of driveway affected by standing water. For example, an area affecting 12 feet of the driveway would require approximately 180 feet (15×12) of drain tile. Upgraded pavers: Natural stone paver, bricks and thicker pavers all cost more than concrete 2 3/8” pavers. The cost increase will be 25% to 100% based on the product you choose. The prices here are for standard concrete 2 3/8” pavers. Permits: Driveway permits are required in most counties and cities to ensure that the location of the driveway offers good visibility from the roadway and driveway. Inspection is included to make sure the preparation and installation is handled properly. Retaining walls: Hillsides and excavation well below grade often must be shored up with retaining walls to prevent soils from caving in. Retaining walls cost $25-$35 per square foot. For example, a wall 30 feet long and 4 feet high, 120 square feet, would cost $3,000 to $4,200. Possessing a realistic estimate of what your cost will be before you get bids will help you select a contractor offering a competitive price for a quality driveway. 1). 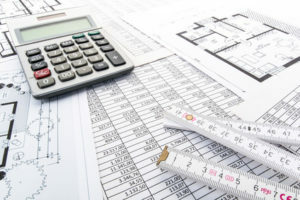 Start your estimate with the standard cost for your project. Remember that if your current driveway is gravel, asphalt or concrete, it is likely that existing sublayers will be usable for your paver driveway. Here is the cost summary. Upgraded pavers: 25% to 100% based on the product you choose. This breakdown of a recent paver driveway installation shows how all the numbers come together. The home is located in a new development of upscale homes in land that was formerly hayfield near 40 minutes southwest of Nashville, TN. While the area is rolling, this parcel is quite flat. The soil is clay loam beneath thick topsoil. The driveway is 12’ wide and 80’ long before it makes a 60-degree turn around a tree line and broadens to a parking pad and patio area 24’ deep and 50’ wide. Driveway excavation: About 6” of topsoil was removed and stockpiled for future use. An additional 7” of soil was removed and hauled away. A large, storm-damaged oak was removed and its root cavity was filled with gravel and compacted. Several trees ranging in size from 8” to 14” were removed at the road. The analysis of this job shows that it is slightly above the median cost for paver driveways, but certainly within what would be expected. Increases in excavating the property and trucking materials to the site were the primary cause of the modestly higher cost. As you browse paver driveway estimates online, you’ll find quite a range. It is sometimes impossible to know what is included in the estimate and what is not part of it. We provide you with detailed information that produces an accurate estimate based on what needs to be done on your project. Our goal is to assist you in comparing driveway costs for pavers, asphalt and concrete, so you can make an educated choice. When you are ready to entertain bids for the job, we suggest contacting at least three contractors, and let them know that they are competing for the work. Get references. Ask for addresses of driveways they’ve done recently and 5-15 years earlier, to see how they’re holding up. This due diligence gives you the best opportunity to get competitive bids for quality work that will continue to look good in the years ahead. While paver driveways cost more than most, they require the least amount of maintenance. Weeds will occasionally appear between the pavers. They can be pulled or eliminated with herbicide. The rare broken paver can be extracted and replace. The process is far easier and less costly than patching concrete or asphalt. Shoveling and plowing snow from paver stone driveways can sometimes cause damage to them. One solution to this potential problem is to install a system beneath the drive that will melt snow and ice. Both hydronic and electric systems are available. The system can be installed as part of the overall driveway installation. A heated driveway system costs $12-$22 per square foot, so it is a significant investment. When properly installed and maintained, a paver driveway will last at least 35 years. Some have been in use for a century or more!